Allied troops fall back on Bresles front, 60 miles north of Paris. King Haakon of Norway, his family and government, evacuate from Norway to Britain as Germans advance. The first of five heavy night raids by the RAF begins on Brest as Prinz Eugen shelters there. First US Lend-Lease planes flown to Maine and shoved over border into Canada, because neutrality laws forbid landing in Canada. General Erich von Manstein hurls his troops in the grand assault on the besieged port of Sevastopol in a two-pronged assault. The Soviets resist fanatically in excellent fortifications. The Germans gain ground but take heavy casualties, and have to bring in reinforcements to take the city. However, the continuous German attacks wear down the defenders ammunition supplies, which must be brought in by sea through a tight German blockade maintained by the Luftwaffe, E-boats, and Italian midget submarines. All Jews over six are forced to wear the ‘Star of David’ in Occupied France. The Japanese make landings on Attu and Kiska Islands in the Aleutian Islands. In the Battle of Midway, carrier USS Yorktown sinks due to damage by Japanese submarine I-168 the previous day, but the US is victorious in the major turning point of the Pacific War; from now on, the Japanese will be on the defensive. 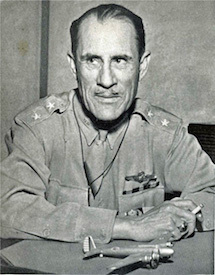 Maj. Gen. Clarence Tinker, commander of US Seventh Air Force, is killed when his plane is lost off Midway, the first Native American to reach rank of major general and the first US general killed in WWII. British troops liberate Bayeux, five miles inland from the Normandy coast. All beachheads are reported as established. The British 2nd Division is now only 55 miles from Imphal. Mokmer airfield on Biak is captured by U.S. troops. The Americans take Civitavecchia on the western coast of Italy. King Haakon VII returns to Norway, on the fifth anniversary of his leaving the country. The first allied cargo ship for three years enters Wewak Harbour, in New Guinea. US Marines cut off Oroku Peninsula on Okinawa.